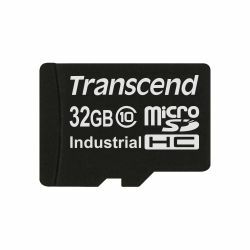 Transcend industrial-grade microSD cards offer greater design flexibility and cost savings. Despite their compact size, the microSD cards have excellent temperature flexibility from -40°C to 85°C. The cards are manufactured with high-quality controller and MLC flash chips, providing excellent shock and vibration resistance and low power consumption that help to bring the performance and reliability advantages of industrial memory cards to small form factor devices.